Georgie Henderson is having a bad year. As a new – working – mum, she strives to be Sheryl Sandberg at work and Martha Stewart at home. But she’s discovering that in the twenty-first century being a Good Working Mum means answering emails at midnight while you purée vegetables and line up play dates and French lessons for your four-month-old daughter. Georgie’s ex, Jase, gets 100 per cent of the credit for 5 per cent of the work, and her best friend, Nina, is on a ‘self-discovery’ journey that involves a 25-year-old bartender and a plan to become an artisanal florist. And all Georgie’s mum wants is for Georgie to find a man. Preferably the one who is the father of her child . 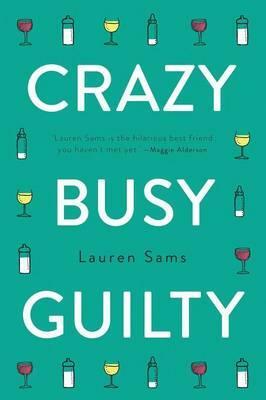 . .
Lauren Sams began her career at Cosmopolitan before moving to Girlfriend as deputy editor. She's now back at Cosmo as Associate Editor (Special Projects) and Managing Editor of Cosmopolitan Bride. She writes for Elle, Marie Claire and Sunday Style, and her work regularly appears on dailylife.com.au. She lives in Sydney with her husband, daughter and two dogs. Elaine Benes is her spirit animal. LBN ART NEWS . . . The Museo Atlántico in Playa Blanca is the only underwater sculpture museum in Europe. It has been open to the public since 2 March 2016. Divers can dive here amongst the impressive sculptures of artist Jason deCaires Taylor, famous for his underwater art. 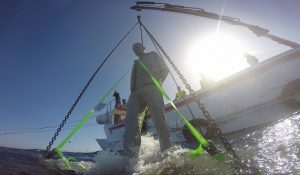 He was behind the world’s first underwater sculpture park, off Grenada in the Caribbean and a submerged museum off the coast of Cancún, Mexico. The underwater museum in Lanzarote is situated in a protected area near Coloradas at a deph of 15 meters. The Museo Atlántico will be built in several phases. The first phase, which consists of six different groups, is now complete. Los Jolateras, the first component, is a group of children in little brass boats. You can also see the famous Raft of Lampedusa, a reference to the current refugee crisis. The sculptures of a couple taking a selfie and some photographers refer to the use of new technology in our modern society. The Rubicon is a group of 35 human figures all facing the same direction, towards the point of no return. The models used for these sculptures are Lanzarote residents. Also there are several hybrid sculptures (half human, half cactus) showing the merging of nature and humanity, existing together in harmony. When complete the Museo Atlántico will comprise several large-scale installations as well as more than 300 individual sculptures, designed to create a marine habitat and social awareness. For additional information visit www.underwatermuseulanzorote.com/en. Carmel-by-the-Sea has more than 100 art galleries—featuring creations by scores of internationally acclaimed artists—but it is the 21 artist-owned galleries that host Carmel Art Walk, held from 5 to 8 p.m. the second Saturday of every month. The next two Art Walks are scheduled for Feb. 11 and March 11. During each walk, the artists can be found in their galleries, showing their works, and answering questions, while many give free demonstrations. Some of the galleries serve refreshments, others offer live music. Carmel Art Walk has its own website—CarmelArtWalk.com—as well as a four-color map listing the galleries, the artists, and their locations. For more information, visit www.CarmelArtWalk.com, or send Turner an email at jtfineart@gmail.com. Carmel Art Walk is separate from Carmel Art Tours, which offers 90-minute guided, informal walking tours to as many as eight of the village’s art galleries. It’s never been easier to get to Carmel-by-the-Sea. Monterey Regional Airport (MRY) is just a 10-minute drive away and served by direct flights to and from San Francisco (SFO, United Express), Los Angeles (LAX, United Express, Alaska Airlines), Las Vegas (LAS, Allegiant Air), Phoenix (PHX, American), and San Diego (SAN, Alaska Airlines). San Jose International Airport (SJC) is 75 miles north. For more information and exclusive hotel rates, book direct at CarmelCalifornia.com.